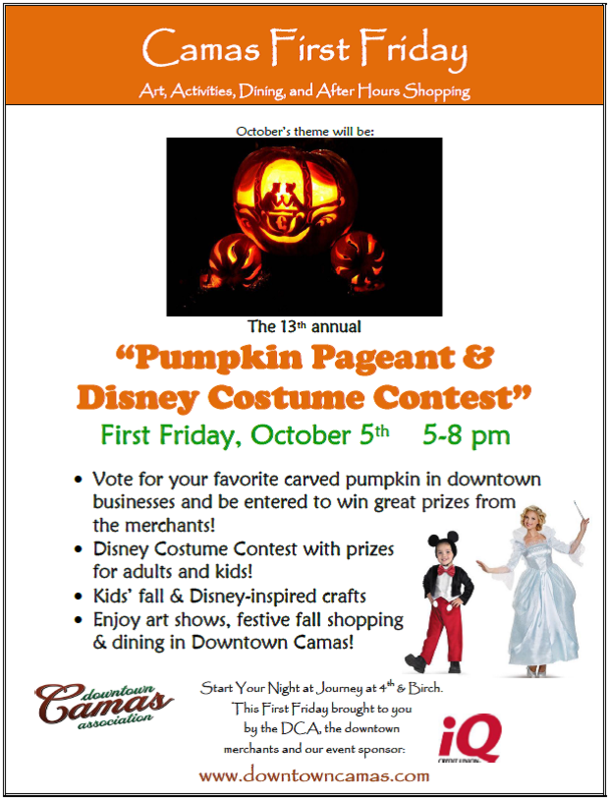 Join us October 5th, 5-8pm, for the 13th Annual “Pumpkin Pageant,” Disney Costume Contest and all sorts of fall fun! Prizes for both winner and runner up for Best Disney Costume for both Adults and Kids. Thank you iQ Credit Union for sponsoring! Second Story Gallery will host a reception for the fiber art show “Story Time”from 5-8pm. The art pieces are inspired by book titles and are created by fiber artists Linda Reinert, CarolAnne Olson, Hedda Wright, Judith Phelps, Mary Kay Price and Dianne Kane. They say viewers will be intrigued by the variety of pieces inspired by each book title, illustrated with wide-ranging techniques including applique, piecing and painting on fabric. Refreshments will be served. The art show will continue through November 30th. 625 NE 4th Ave.
Camas Gallery will feature painter Rob Blackaby, a multi-disciplinary fine artist at their First Friday artist reception along with refreshments and live music, 5-8pm, 408 NE 4th. Attic Gallery’s featured artist will be Earl Hamilton, a favorite artist in this gallery, with many new abstract paintings for the show. Reception runs from 5-8pm with live music by Paul Chasman, wine and refreshments, 421 NE Cedar. Enjoy festive shopping and dining all though town! Start your night at Journey to pick up the participation and activity list at the DCA tables, 304 NE 4th Ave. See you then!